In less time than it took the General Assembly to pass it, a federal judge in Greensboro nixed the city redistricting that Sen. Trudy Wade really really wanted to impose on her hometown. Sen. Wade is pissed, too, and whining publicly that the Attorney General's office didn't show up in court to defend her gerrymandering. "It is shameful that Attorney General Roy Cooper refuses to do his duty and defend state law," Wade said yesterday. But the lawsuit wasn't against the State of North Carolina, and Roy Cooper had told leaders in the General Assembly in advance of the court hearing that they would have to defend the law themselves. Did they? No. 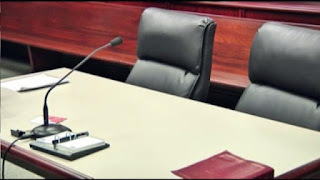 In fact, no one showed up in Judge Eagles' courtroom to defend Trudy Wade's redistricting. No one. Suggesting, we assume, that the Trudy Wade redistricting was indefensible. Also an embarrassment -- a local power-grab so nakedly unsupportable that not one sleazy lawyer could be found in the universe to slink into court to make an argument in its defense.